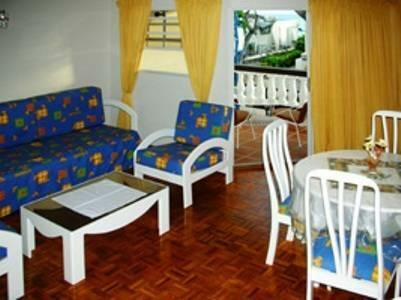 ﻿ Best Price on Mirabelle Apartment Hotel in Christ Church + Reviews! On St. Lawrence Gap’s lively main street, these air-conditioned apartments are only 100 yards from Dover Beach and all include a full kitchen. Bridgetown is 5 miles away. Mirabelle Apartment Hotel features spacious apartments with a furnished balcony overlooking the main street. The bedroom has 2 single beds or one extra large double bed. Wi-Fi is available at a small extra cost. There is a beauty salon and internet cafe on the ground level of the apartment complex. Guests will find plenty of restaurants, shops and small supermarkets in the vicinity. Guests can enjoy a wide range of water sports at Dover Beach. There is also a children’s playground. Grantley Adams International Airport is a 15 minute drive away. All people checking into the Mirabelle Apartments after 16:00 daily, weekends and public holidays are asked to come to the reception desk at Monteray Apartments to check-in and collect the room keys. The taxi driver is required to wait while the guest check in and collect the room keys before going to Mirabelle Apartments. Monteray Apartments is 1.2 mi aprox from Mirabelle Apartments. Please note that check-in and key collection take place at: 2nd Avenue Dover Christ Church, Christ Church BB15023.